When hunger and inspiration come together, delicious dishes appear. That was the case for me today. I had some chicken thighs, kale, and onions in the fridge, along with coconut milk. Added some spices: ginger powder, turmeric powder, coriander powder, salt, pepper, and lemongrass, and put them all in a slow cooker. Left it on high for about four hours and let the magic happened. The sweet smell of coconut milk mixed onions, lemongrass, and kale made the chicken so aromatic. The meat was so tender and melted in the mouth. And the kale tasted so rich for being cooked with all of the spices and juices from the chicken. I separated the chicken and kale at the end. 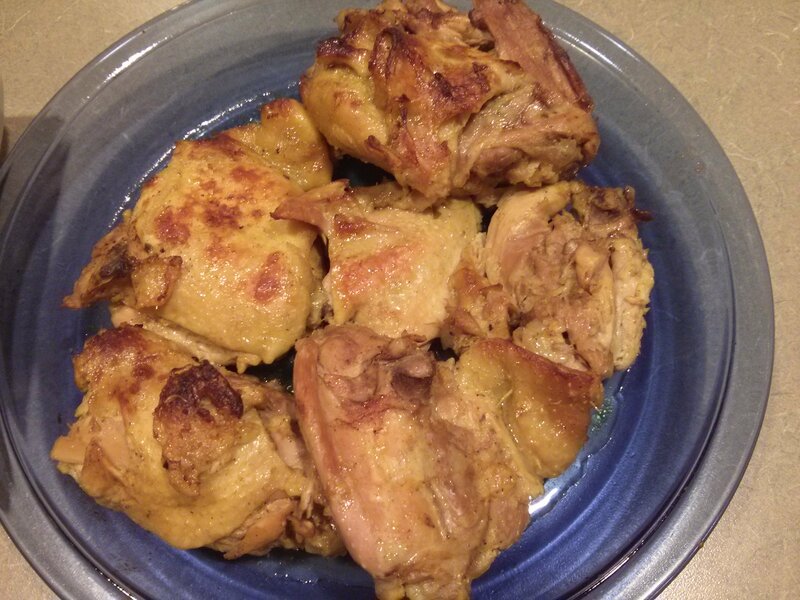 I also wanted to add some golden color on the chicken so I put it in the oven to broil for five minutes (this last part is completely optional). Recently, a friend had recommended a slow cooker to me. She said that it has freed her from standing for a long time in front of the stove while cooking, which allowed her to tend to other things. Curiosity and the need to tend to other things (while still wanting to cook too), drove me to Target to get a small slow cooker :D. The results have been promising. So I will keep on trying different things in my slow cooker. Set the cooker on high and left it for about four hours (I mixed everything again while it was cooking). I used the remaining broth to cook tofu. Just put the broth in a pot on a stove, medium heat, added firm tofu that I diced, let it simmer for a bit and ta…da…another dish! Wishing all of you a good week!